With my dress form "batted" and corseted to my client's measurements, I started working on her pattern. 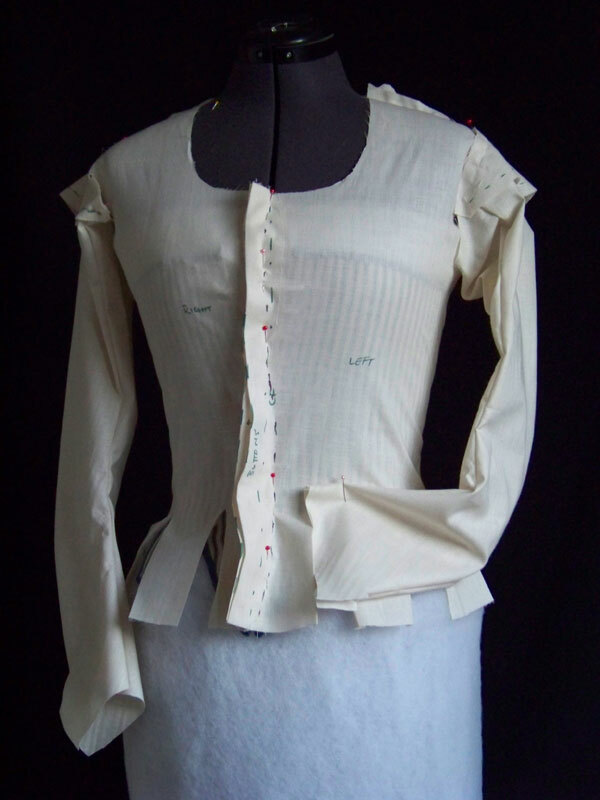 I drafted this pattern with help from a little scribble I made in my journal years ago (from The Cut of Women's Clothes: 1600-1930 ) and referencing the Tudor Tailor: reconstructing sixteenth- century dress . Pleased with myself, I cut the pattern out of some freshly-harvested muslin and quickly zipped in all 7 gussets, sewed the back to the front, and tested the fit on my dress form. Why? but how? but WHY!? Mmmm, gussssssets. I love this style of jacket because it's perfect evidence of how fabric was so precious; the pattern literally uses scraps and bits of fabric to create the width and fullness of the skirt. Ladies, take note. For those of you who ever draft/drape/create a gusseted Elizabethan or Jacobean jacket, it is *very important* that you do *not* cut the slashes for the gussets too high! They do *not* go up to the waist, but instead allow the jacket to flare over the hips, which are a good many inches below the waist. I had to recut the front and back pieces, and do all the gussets over again (despite this being just a toile, that was still annoying), because I got my engineering wrong! The slashes end at least 2" below the waistline. The side w/o sleeve and w/o gussets. The width of the gussets will determine the flare of the peplum. Already it's deciding its own self. 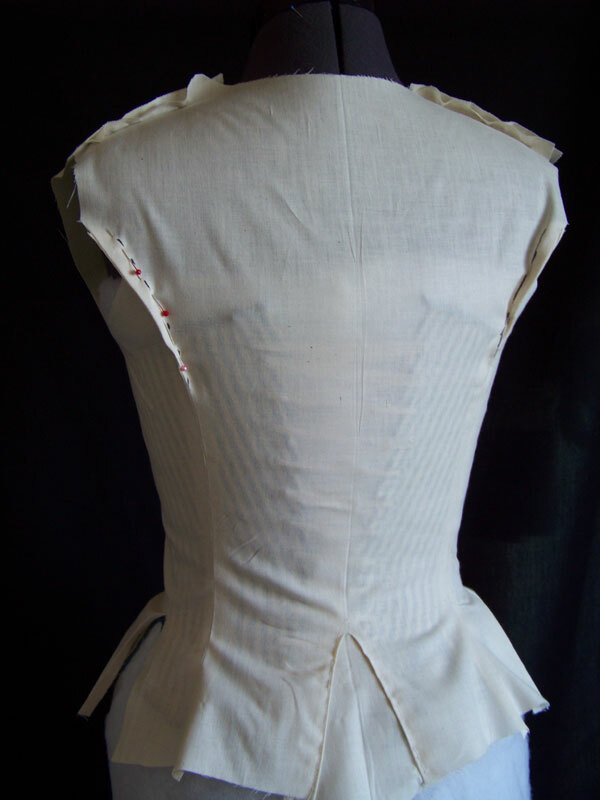 The toile was still a little big through the waist, so I pinched the front edges and marked the new center front line, which when spread out flat will form a distinct curve. I will need to adjust the front placket, for the buttons, before sending this out for my client to try on. 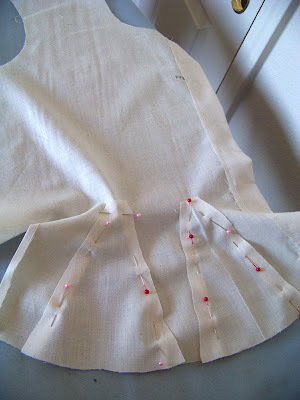 Pinching the excess through the back seams, to tailor it to the form. Very cool! And good to know should I ever decide to head towards 17th century costuming! When sewing costumes, can you do the skirt work on a machine, or must it be done by hand AND, which machines are best for handling all that material? Thanks ladies! Yes, you'd think it would be obvious not to cut the slashes too high, right? I felt kindof embarassed about that one, LOL. Tea Duchess - I put the gussets in by hand, on the final piece. I'll zip them in on the machine for the toile, because they just need to be in there, but when it comes to the finished garment, I sew each of them in by hand because of the way the edges of the slash fold back. It requires preciseness or else you run the risk of things coming unravelled at the top, where they come to a point. The first time I made a jacket like this, though, I put them in with the machine and was just very careful, and it turned out alright. What fun. I'll bet the finished product is beautiful. I wonder what the fabric will be. Ah yes, that's an important thing to be aware of, should I ever decide to make a jacket like that! So you know what? It's not just 17th century. 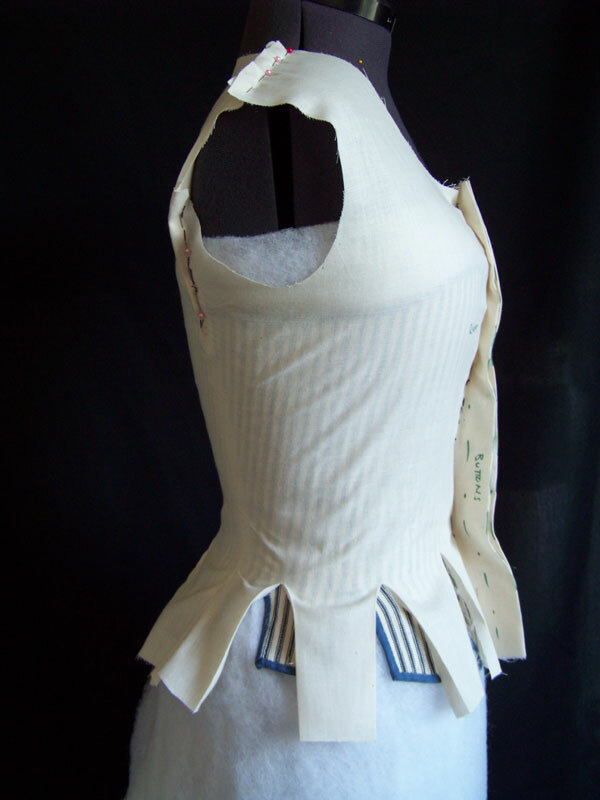 It helped me figure out what was the problem with the muslin of my medieval dress. The gusset in the back piece was inserted too high. (In the end I decided to move the gussetting completely to the sides, but it started with figuring out that those odd wrinkles were caused by the gusset being too high.) And now I think I can make it work, after months of being too shy to do anything about it! Thank you. I hope this project goes equally well for you! Oh that's right, I'd forgotten that medieval gowns make use of skirt gussets. Ah ha! So we've solved the mystery! I finished the toile for this jacket tonight and will be sending it out to Mary tomorrow. I'm very happy with it, and I feel I learned a lot. I'm happy to pass the knowledge on!